Breville Joe Cross JJE100 is a centrifugal juice extractor with the Cold Spin Technology and a 700-watt power motor. It comes with the “Fresh Start” recipe book and the “Fat, Sick and Nearly Dead” DVD. Breville Joe Cross is great for those that want to start eating and drinking healthier or go on a raw food diet. It comes with a vacuum sealed 60 oz. juice jug so you can either drink your juice now or put it in the fridge for later as it will keep fresh longer. Centrifugal juicers tend to have a worse reputation than slow masticating juicers when it comes to keeping the minerals, vitamins and healthy enzymes because of the fast speed powerful processing.But thanks to the great Cold Spin Technology the new Breville Joe Cross is pretty good in that sense. It is easy to operate and does the job well and super quickly with the cold spin. There is a stainless steel cutting disc that will give you more of vitamins and minerals. And the juice is filtered through a micro-mesh filter so there is as little temperature transfer as possible. You don’t have to peel and cut the fruits into smaller pieces as it includes a 3-inch large whole fruit and veggie feeder. The lid needs to be locked into its place for the juicer to work, or the juicer will be prevented by the Interlocking Safety Arm from working. 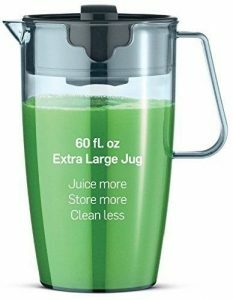 Breville Joe Cross Juicer weighs 21 pounds and measures 14 x 8 x 16 inches, so it takes up a bit of space with the pulp container and the large juice jug. And you may want to put them away and not leave on the counter. The large 60-ounce juice jug and the elevated nozzle with a special design let you have more juice in one go. The dry pulp goes into the 2.5-liter capacity very large pulp container during the process. Once you’re done with juicing it is easy to disassemble and clean up in just a few minutes or so but bear in mind that there are a few parts. It runs quieter and spins up faster than the competitors and delivers more juice as well. It has a powerful 700-watt motor (110/120V 60Hz) that is suitable for use with the Canadian and US electrical outlets. Please note that this is a promotional product with a 12 month Breville warranty but the replacement parts are not available at the moment if you need them in the future. It is designed more for home use and you probably need a more advanced commercial grade model to use in a restaurant or a cafe setting. In contrary to what juicer sellers claim, it is always better eating the whole fruit without removing the dietary fiber. But juicing is still a great and easy way of adding fresh produce into your diet as eating whole fruits or veggies is not easy for a lot of people. With the new Breville Joe Cross Juicer, you can juice all sorts of fruits and veggies, like apples, carrots, beets, cucumbers, kale, celery, ginger, berries and more and with some decent results- smooth juice without pulp. You may use the nozzle provided if you wish to get just a glass of juice rather than a whole jug. This is a good all rounder unit for the price level but the pulp is not very dry and you may have better options too, so you may want to check them out through the links on this page. 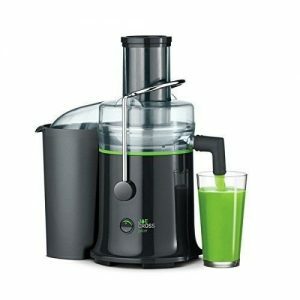 Warranty offered is 12 months by Breville, the designer and the manufacturer of this juicer.